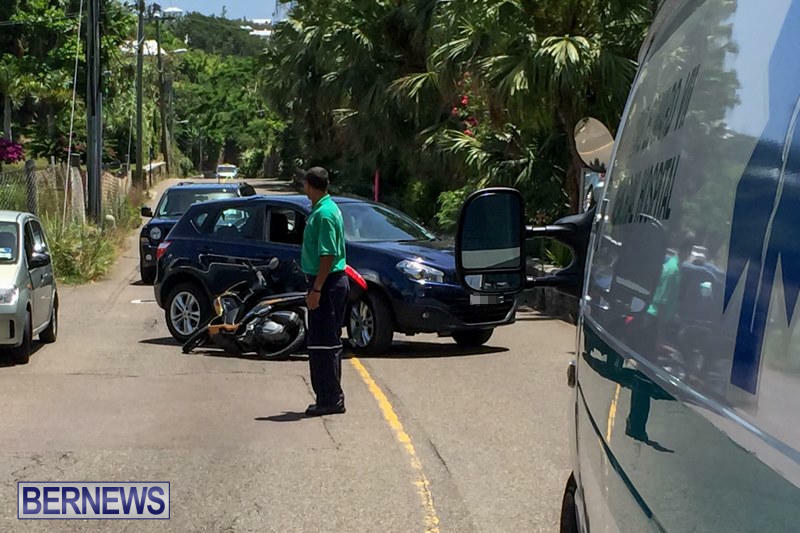 [Updated] Emergency services responded to a collision that appeared to involve a car and motorcycle on South Road, Smiths near Zuill’s Park Road at approximately 12.00pm. Bermuda Fire and Rescue Service personnel tended to the injured man until an ambulance arrived and transported him to King Edward Memorial Hospital for treatment. Details are limited at this time, however we will update as able. Update: A police spokesperson said, “Around 12 noon on Monday, June 29th first responders were dispatched to a reported two vehicle collision at the junction of South Road and Zuill’s Park Road in Smith’s parish. “It appears that a motorcycle being ridden along South Road collided with a car being driven out of Zuill’s Park Road. I saw this accident and clearly the car driver was at fault but it is an absolutely terrible junction.